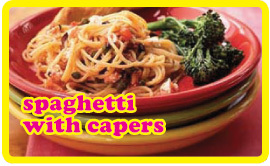 I love a bit of a caper. The saltiness and sourness all in one is fabulous. This is an unusual way to eat pasta as it has an uncooked sauce. I was a little dubious but I must say it was brilliant. If you’re a crap cook, all you need to master for this is how to cook pasta. And it even tells you how to do that on the packet you moron. Cook the spaghetti in a large pan full of water according to the instructions. While it’s cooking, Combine all the other ingredients in a large bowl. When the pasta is ready (take a ladleful of the water and set aside). Drain the pasta. Put the tomato mixture into the pan together with 1/2 the reserved cooking water. Add the pasta back to the pan and mix well before serving. Serve with a little salt & pepper and a bit of cheese if you feel the urge. Also nice to serve a little less pasta and something green alongside!